About 17 years ago, there was a blast and it gave a new identity to India on the world platform and amidst the entire team of learned scientists, one man stood apart – Dr. A P J Abdul Kalam. And today when we still mourn the loss of this great being, I looked back at what was his greatest gift to this country – a sense of respect and security amidst its peers! So what was this gift and how did it all happen? Read the article to know all about it. This was formal announcement of India attaining capability to build and launch nuclear weapons and a message that we have successfully tested this capability. This was the moment that made India a nuclear power making an (unwelcomed at the time) entry in to the club of nuclear capable countries. 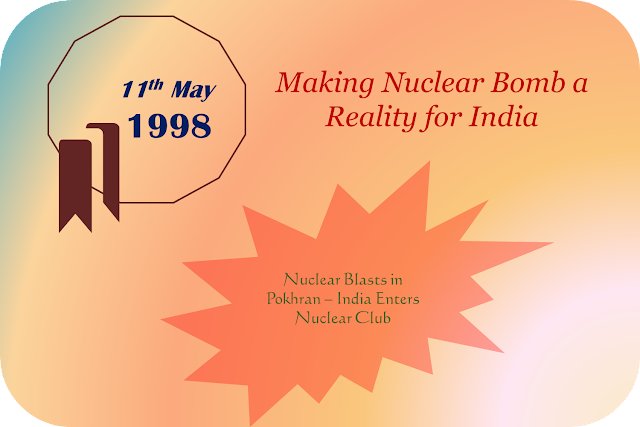 These blasts in Pokhran became testimony of India’s might and forced world to realize our power. This was a clear message to the world in general and our foes in specific that India was no longer a state that could be taken for granted. While many may challenge the need for these tests, but I believe that this capability was a necessity to vacate the nuclear threat that was developing against our country. It wasn’t an aggressive stance that we aimed to achieve with this capability. It is said that India had strived to obtain assurance under a nuclear umbrella which would protect us in case of a nuclear aggression but were not able to secure one owning to our non-commitment to any specific power blocs of the world. The entire operation to build and test the nuclear weapons was codenamed as Operation Shakti. The foundation of the program was laid in 1974 itself when first blasts were conducted in Pokhran to dangle our feet in the aim to build nuclear capability. However, as one would tend to expect, these are not easy decisions and any government across the world trying to do something like this would face huge pressure from both within and outside. Same happened to us and under immense political and international pressure; the then government backtracked on this initiative and placed it on backburner at that time. Though many believe that we already had the required capability at the time of first attempt and only thing that remained was an official and credible show-off to the world. However, it was not an overnight miracle that India achieved this fate. There was a long history of innovation and development in field of nuclear science guided by top scientists that finally culminated in these tests being successful. India started activities in field of nuclear science within 8 months of its independence with establishment of Atomic Energy Commission based on provisions of the Atomic Energy Act. Though this was start in the field, then Prime Minister Jawahar Lal Nehru was strong supporter of only peaceful use of nuclear science. India already has some knowhow until then thanks to Dr. Homi Jehangir Bhabha who had started research in field way back in 1935. He became the first Secretary of the Department of Atomic Energy. The department has always had a very critical strategic importance and this is illustrated by the fact that Secretary of this department has traditionally reported directly to the Prime Minister. Bhabha, at the time had a strong belief that if required, India could develop a nuclear bomb within 2 years but was restricted by Nehru who wanted to build the capability but did not allow building the bomb. However world is a strange place and global events have the strength to change the course of leaders beliefs. Soon after defeating India in Sino India war in 1962, China tested nuclear weapon within two years of war. Post the defeat, there already was an environment of suspicion between the two countries. Many in India felt that this was an imminent threat to us and it was then that the political community in India first demanded a nuclear bomb. However, there was a change in leadership in India and the new Prime Minister, Lal Bahadur Shastri was ardently opposed to the nuclear capability itself. He was more focused on internal issues of poverty and malnutrition. However, this was unacceptable to Dr. Bhabha who made public appearances in support of nuclear science and this had its effect in secluding Shastri within his own party. Even the political community of India was growing restless on the security front and the issue found its way into the Parliament. After intense discussions within the Parliament, Shastri had to finally give up his stand and he agreed to develop nuclear capability. However, this had limited impact and soon after this both Shastri and Dr. Bhabha died in 1965 and there was a short discontinuity in India’s nuclear program. Dr. Vikram Sarabhai, who took over the Atomic Energy Commission, was opposed to idea of the bomb and hence the program faced a setback. Indira Gandhi was initially influenced by him but later, just before the 1971 war; she was advised to keep the program intact. Thus the long slumped nuclear program was revived in 1968. After some prolonged research and development, India finally conducted first set of nuclear test blasts on 18th May 1974. Though we officially termed them as peaceful tests without any linkage to a bomb, global community grew suspicious of India’s intentions and started calling it a covert nuclear state. The growing pressure did force us to keep the program on back-burner for some time. Next encouragement to the program came under P. V. Narasimha Rao who was in favor of the capability. He instructed the scientific community and the commission to develop the bomb and be ready for a test, if ordered, within 10 days. However, he made it clear that the date and final call on nuclear tests would be taken by the civilian government and not by the scientific community. Some believe that he however could not take the call under US pressure while others believe that it was because of the delay in developing the technical capability and approaching elections when finally we were ready. He then passed the baton to PM Atal Bihari Vajpayee and communicated the same to him while handing over the charge. Though, Atal had given the order within 2 days of taking charge but by the time the weapons were lowered, he lost the trust vote in parliament. But he came back for another term on 18 March 1998. PM Atal met Kalam before the oath taking, reportedly asking him to be a minister in his government, though the later declined the offer. Kalam and Commission Chairman R Chitambaram met Atal two days after oath, i.e. on 20th March. In this meeting Atal gave the go ahead to prepare for the nuclear tests, with an assurance to have a final decision very soon. Once on 18th May, he proved the majority in parliament, he met scientists to assess the preparations and ordered final go ahead putting Brijesh Mishra as point person for the operation. Date for the tests was finalized keeping many variables in mind including availability of the President and commission chairperson Chitambaram, whose daughter was getting married around the same time. Pokharan was decided as the location keeping various logistic requirements in mind. Abdul Kalam was scientific advisor to PM (along with DRDO head) and he along with Chitambaram was appointed as coordinators for the tests. Bhabha Atomic Research Center and AMDER experts were roped in and made responsible for assembling and collecting test data. With this started the race to the D Day when India would achieve this coveted fate. What was evident was the necessity of extreme secrecy during the entire operation. Everyone knew what the outcome would be if the international community realizes what India was up to. Every activity related to the test was done in night to avoid satellite surveillance of western world. Early morning the sand was covered over the work of night to misguide the prying eyes. Team used code words for communication and the scientist never travelled together nor did they get to Pokhran directly. They wore military uniforms to maintain guise of an army operation rather than civilian involvement. Army presence was not unusual in that area. Everyone had a code name and this is how the team prepared the site and established weaponry and instrumentation. Finally the tests were conducted at 3:45 PM on 11th may 1998 and it was informed to Brijesh Mishra who informed the PM. It was then that Atal informed the country through media. Two more tests were done on 13th May post which India declared end to India’s nuclear testing. All the tests were called successful and this was followed with a press conference of scientists under leadership of Dr. Kalam who briefed the world about the capability, the payload, potential energy and other technicalities related to the nuclear test. Also, we declared no first use policy which assured the world that this would be a defensive capability. However, as expected, it was not an easy way ahead for India. The tests infuriated the world super-powers both at a new-grown power and at their own failure to check the growth. US had always kept any country from developing nuclear weapons and had gone to great extents towards this goal. Though US had apprehensions about India’s nuclear program and hence was maintaining strict vigil to identify any such activities, however they failed this time. Many intelligence agencies, at last, accepted that they failed to collect cues of India’s attempt at developing nuclear capability. Even the CIA head accepted publicly that though they were tracking India’s nuclear program, they did miss this test build up. This is testimony of success of the level of secrecy required for the operation. US along with its allies imposed stiff economic and trade sanctions on India in an attempt to sideline us from world community. Another challenge that emerged out of it was emergence of Kashmir as nuclear flashpoint between India and Pakistan in eyes of the world. However India’s apprehensions were proved right as Pakistan officially tested their nuclear bombs within 15 days of India’s announcement. What many fail to understand is, if even US was unaware about India’s intent how did Pakistan get time to develop the capability so soon. Many believe that Pakistan already had the nuclear bombs with aid of their traditional ally China. It did require the strength of political will of the leadership of the time to take this step which as expected was followed by very difficult times for the country. This hard time only ended with recent nuclear deal with US. Though no one denies that we have paid a huge price for obtaining the tag of being nuclear state but it was a necessity for our existence. Today, after almost one and half decades, we definitely have emerged stronger and self-reliant – and this is a fate far more fruitful then any weapon and stronger than any sanctions we had to face.